1929 - President Herbert Hoover commissioned a national-level study to do for the entire nation what Middletown had done for Muncie, Indiana. Ogburn was chosen as the Research Director. Robert Lynd wrote the chapter on consumption. 1933 - The giant social science project commissioned by President Hoover is published as Recent Social Trends in the United States. 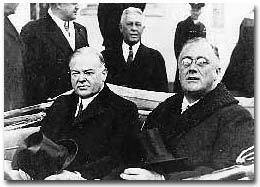 Presidents Hoover and Roosevelt. Courtesy of the National Archives.